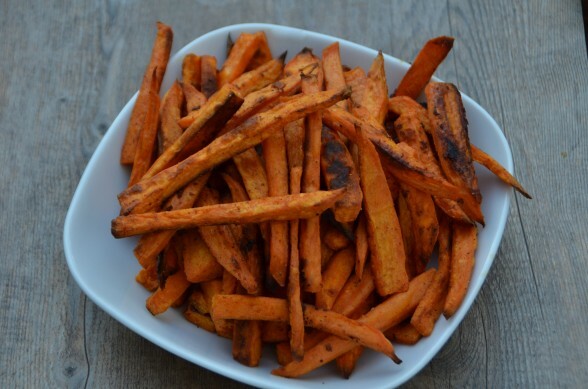 Sweet potato fries have been quite popular in the last few years, usually being touted as a more healthful alternative to regular fries. I can see why that is believable. After all, sweet potatoes are much more nutrient-dense than white potatoes, especially if the white potatoes are peeled and have the majority of their vitamins removed. But once you fry anything, even if it’s organically grown kale from your composted garden, it is no longer a healthful food. This is especially true about food fried in restaurants, which use the cheapest oils, heated over and over and over again until they’re just big vats of free radicals and trans fats. Yuck. Dr. Mercola makes the bold statement that eating one French fry is the equivalent of smoking one cigarette. I’ll be the first to say that Mercola can be a bit of an alarmist, but I do agree that commercially fried foods are among the worst things you can consume, even the beloved sweet potato. if you’re two pans don’t fit in the oven side by side, rotate them halfway during baking. Even following these tips won’t result in fries like your local fast food restaurant, but they also won’t be soggy or limp. Do any of you have some great tips for making baked sweet potato fries? Preheat oven to 450 degrees (or 425 degrees if your oven runs hot.) If you can’t fit two sheet pans side-by-side in the oven, place one rack in the lower third of the oven and another rack in the upper third of the oven. 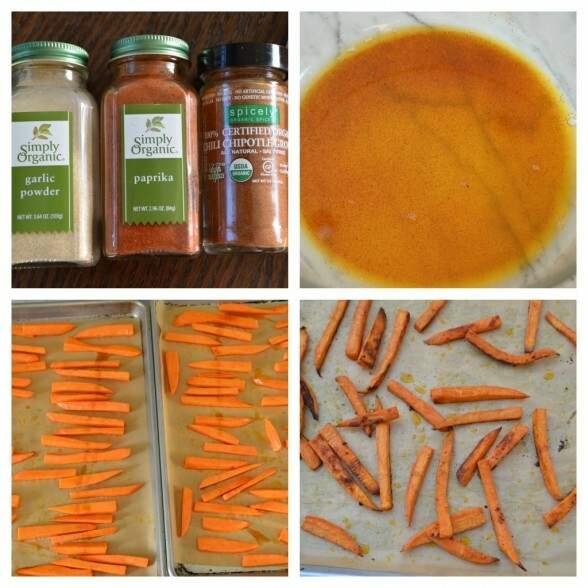 Line two rimmed baking sheets with parchment paper. 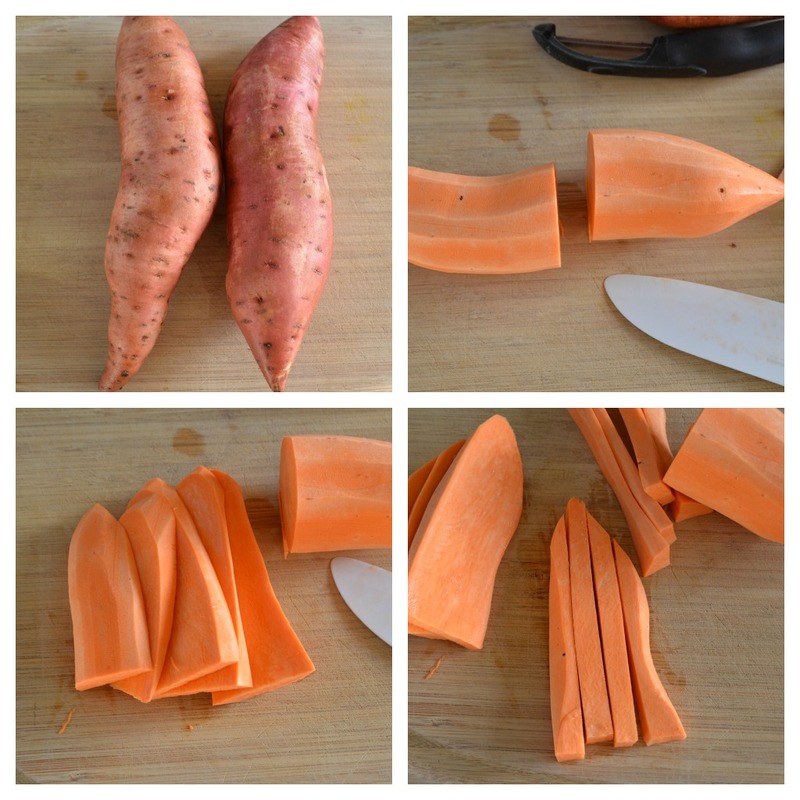 Cut sweet potatoes like French fries, about about ¼-inch by ¼-inch by 3 inches long. In a large bowl, combine oil and seasonings. 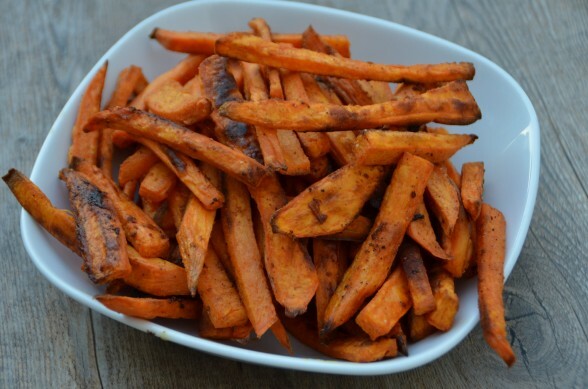 Add sweet potato sticks and toss to coat well. Arrange sweet potatoes on prepared baking sheets in a single layer, evenly spaced. Sprinkle with another pinch of sea salt. Bake 15 minutes and flip potatoes over. Continue to bake until lightly browned at the edges and slightly crisp, but still tender, about 10-15 minutes. If you’d like them to be a little more crisp, put the pan under the broiler for 30-60 seconds. Allow to cool slightly before serving. *These are probably a 5 or 6 out of 10 on the heat scale. Cut the chipotle in half to make it less spicy or substitute smoked paprika to cut out all spiciness. I’ve been soaking my sweet potatoes after cutting them and then rinsing them and drying them before tossing with the oil and spices. I read that by doing so it gets rid of some of the starch… so they turn out crispier. As far as dipping sauce, my family loves honey mustard. It’s just brown mustard, yellow mustard, and honey… so good! I love sweet potato fries. I think this is a recipe that my family would enjoy. My son loves to dip his fries in ketchup. What would you suggest as a good dipping sauce? You can drop the chipotle if your son is little and doesn’t like things spicy. If ketchup will get him to eat sweet potatoes, I say don’t stress about it. Or you could make a homemade ranch for dipping. We eat them plain!